The pause before my reply was noticeably long. The word has connotations. Through my personal filters, adding “ed” after the word church makes it reek of religious knowledge and practices, not relationship with Christ. So, if growing up churched just means my kids grew up knowing the traditions of church – whatever church or religion that might be, then yes, they grew up churched. They know what a call to worship is, they can sing the doxology, they know what to do with an offering plate, they know the different ways to take communion and what an alter call is. They know what the Apostles’ creed is and they know the Lord’s prayer doesn’t end with the words “with liberty and justice for all.” They can follow the verse order of a hymn and even though they both have searchable Bible apps, they can find a scripture in a Bible with paper pages by it’s reference. In more contemporary churches, they know that a worship service usually begins with what we in our family affectionately term a “giddyup Jesus” song, and they know why this video is funny. Here’s the deal. If all that stuff is a precursor to a personal decision for Christ or an expression of a growing relationship with Him, then yes. It is better than nothing. BUT, if all those things are part of their life instead of or apart from a growing relationship with Christ, I don’t necessarily think growing up churched is better. It might actually be worse. I’ve personally met so. many. people. who grew up going to church and as an adult, have not only abandoned church, but faith altogether. One clear and constant answer has been the fact that so many people have turned away from faith in Christ without ever really knowing what it is. Growing up churched has kept more than a few people from relationship with Christ because they think that all those things I mentioned about church is evidence of a relationship with Christ. That’s what I was thinking during the extended silence that followed the “Did your kids grow up churched?” question. But when I broke that silence, what did I say? I am so articulate sometimes. We went to church on Sunday mornings, did a few summers of VBS, went to some fall costume parties, some Christmas breakfasts with Santa and some Easter egg hunts. Sunday school was mostly Bible stories and crafts. VBS was a rotation of Bible stories, crafting sessions and outdoor games interspersed with music, snacks and cute videos with moral and ethical messages. They learned that God loved them. They learned they should help people. They learned God wanted them to be “good” like Jesus. They learned that they should give joyfully. But my kids first learned about having a relationship with Christ from my husband and I. Because we knew that our faith couldn’t be theirs by force or wishes, we prayed that the Holy Spirit would draw them to Christ, and we told them about Jesus. Through our lives – our words and our actions – they saw what faith in Christ really is – a relationship. They knew Jesus loved them – no matter what – just like we loved them. We prayed with them, we did family devotions together, we were authentic with them about the lessons God was teaching us, we listened to their problems, their fears and their joys and we continuously helped them to view and navigate all three through faith in God. By the grace of God, they both accepted Christ at a very early age. By the grace of God and equipped by the Holy Spirit, we did our best to disciple them as they grew in their faith. Regardless of the tangential beliefs we each have, we share faith in Jesus Christ as our Savior and Lord. All four of us depend on the Holy Spirit to equip us for the life we live, striving to follow the Father’s will. My husband and I are confident that each of our children have their own faith in and relationship with Christ. We pray for those relationships regularly. But “Did your kids grow up churched?” is a yes or no question. There wasn’t time to think through all that, much less say it. 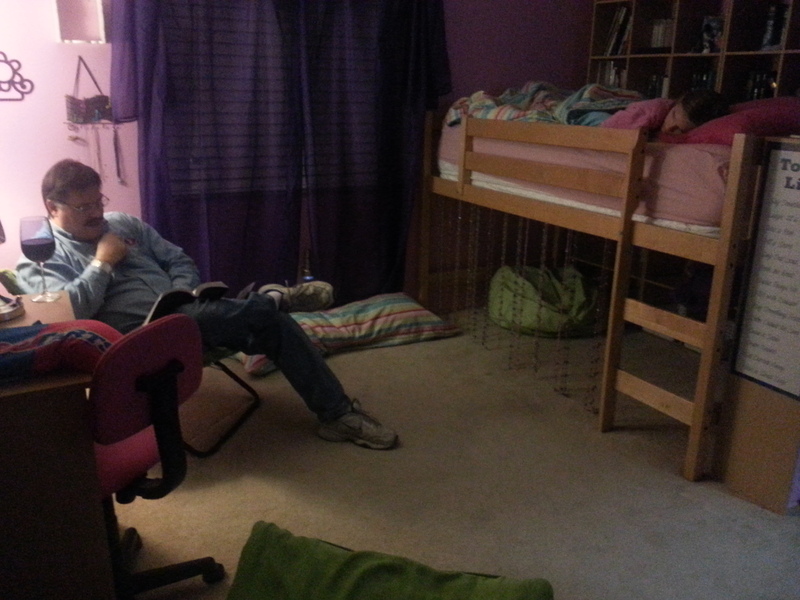 FavoriteDaddy reading The Hobbit to PinkGirl last night. and just like that. Summer is over.